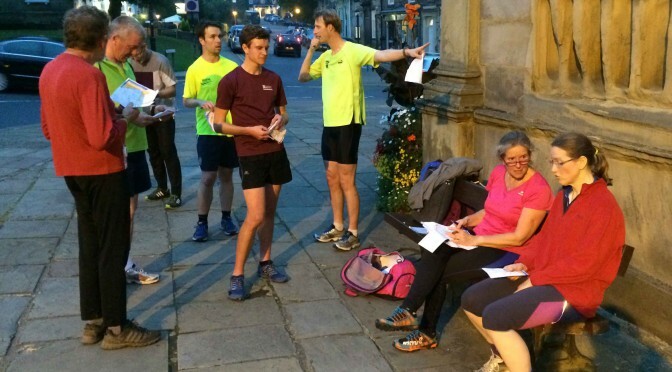 There will be a further series of the popular LampO events on Wednesday evenings in Harrogate and Ripon. Initial details are below and will be updated as details are settled. We hope to see you there! Next event: Wednesday 21 March 2018 – Pateley Bridge. Meet at Nidd Walk car park, just on north side of main river bridge. OS99/158656 or HG3 5NA. Please note START AT 7PM to allow travelling time. Afterwards at the Crown on Pateley High Street, food served. These will be simple events using the well tested format – the maps will be from Open Orienteering Maps – largely black and white representations of the chosen area, with streets marked on as black lines – no buildings to act as identifying features – so you’ll need good contact with the map. All “controls” will be lampposts. Individual lampposts will not be marked on the map – just those chosen as control sites. Every lamppost is marked (somewhere on it!) by the council with a number. Along with the map will be a card to write down the lamppost number when you get there, so bring a pen and a watch! The maps should be on waterproof paper, but a map bag might be needed (though we should have some spares). The cost will be £2 for seniors and £1 for juniors. Unfortunately, as the events are on public roads, juniors (Under 16s) can only take part if they are accompanied by a parent due to BOF insurance requirements. High viz/reflective clothing is required for safety (compulsory for insurance). Don’t forget: pen/pencil, watch, £2, map bag, head torch, hi-viz clothing. The events will all be mass start at 6:30pm with a 45 minute time limit. Registration is from 6:15pm. 10 points for each correct lamppost, 10 point deducted for every minute (and part minute) late back. As last year, locations will be from a pub so that we can have some social time afterwards for those that want it.